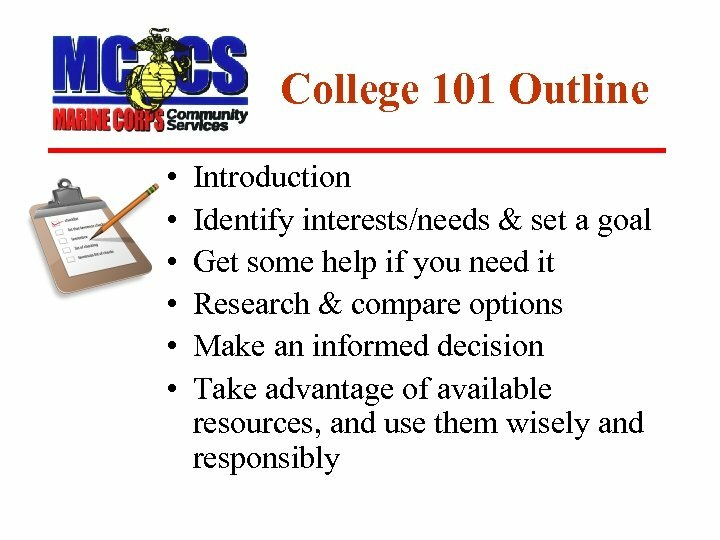 College 101 OORAH! MOTIVATED! • You’re viewing this presentation, which means that you’ve taken the most important step – the FIRST step - toward building a better future for yourself! 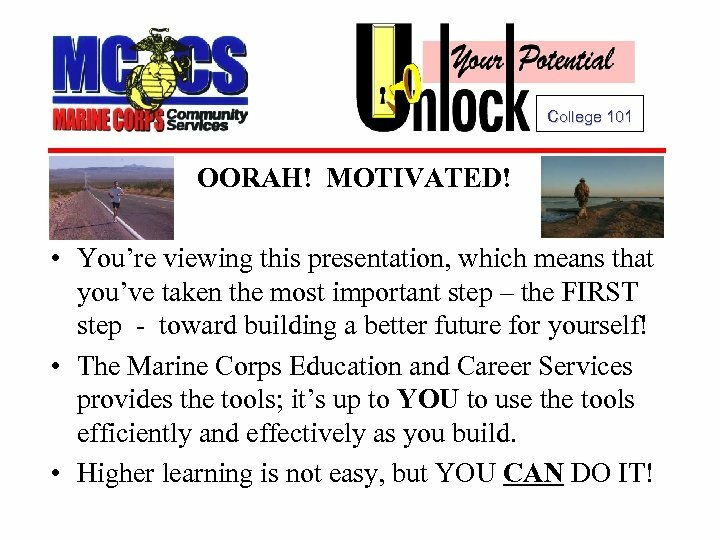 • The Marine Corps Education and Career Services provides the tools; it’s up to YOU to use the tools efficiently and effectively as you build. • Higher learning is not easy, but YOU CAN DO IT! 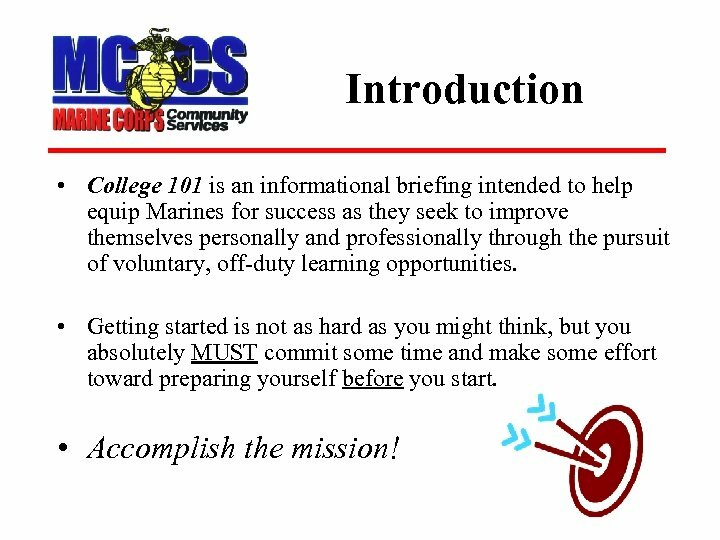 Introduction • College 101 is an informational briefing intended to help equip Marines for success as they seek to improve themselves personally and professionally through the pursuit of voluntary, off-duty learning opportunities. • Getting started is not as hard as you might think, but you absolutely MUST commit some time and make some effort toward preparing yourself before you start. • Accomplish the mission! Do Your Homework • What is your Lifelong Learning “mission”? 1. Set a goal 2. Achieve your goal 3. Repeat steps 1 and 2 • Okay, maybe it’s not quite that easy, but as you begin to plan the early phases of what will be a lifelong journey, to successfully navigate the higher-education terrain, you need an objective, or goal. Do Your Homework • What’s your goal? Do you want to be a firefighter? A medical lab technician? A teacher? Or maybe your immediate goal is just to start assembling basic, general-education building blocks to pave the way for future options? Whatever your wants or needs may be, there is a learning opportunity out there somewhere for you! • When you finally decide on a goal, make sure it’s YOUR goal. 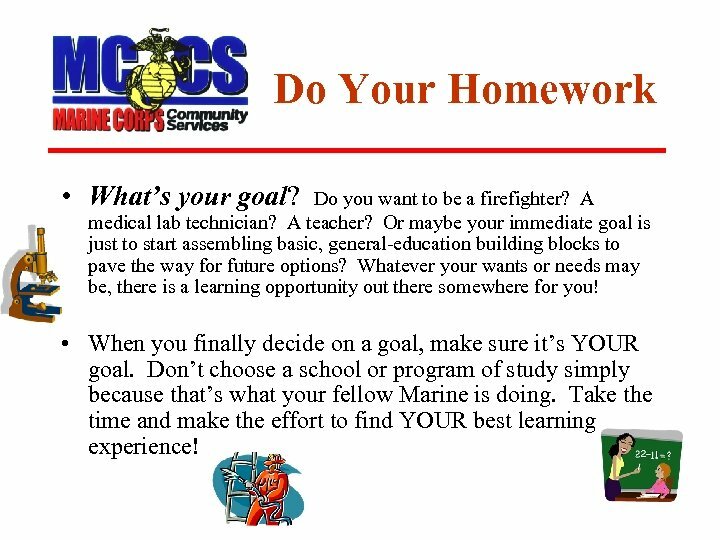 Don’t choose a school or program of study simply because that’s what your fellow Marine is doing. Take the time and make the effort to find YOUR best learning experience! 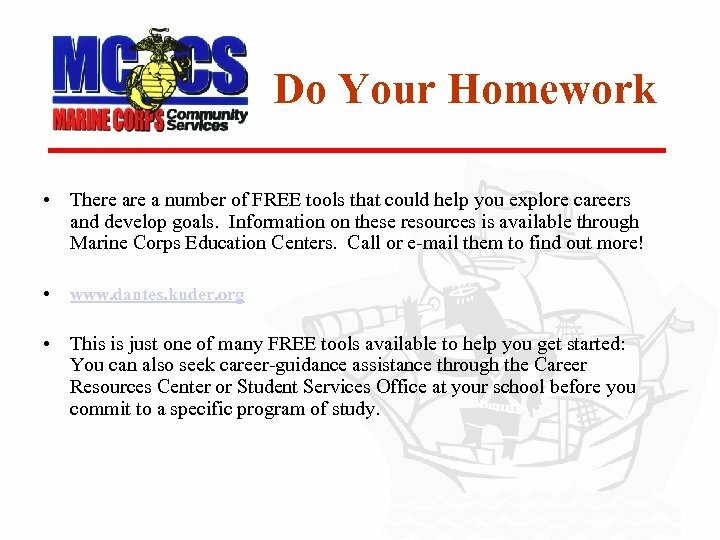 Do Your Homework • There a number of FREE tools that could help you explore careers and develop goals. 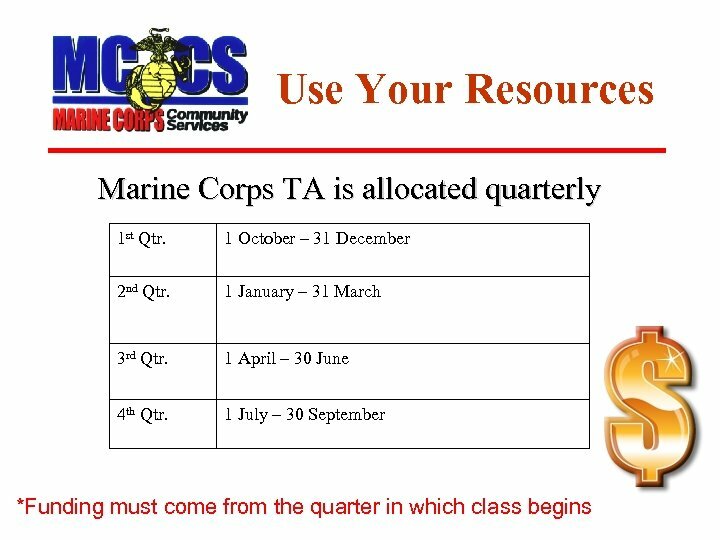 Information on these resources is available through Marine Corps Education Centers. Call or e-mail them to find out more! • www. dantes. kuder. org • This is just one of many FREE tools available to help you get started: You can also seek career-guidance assistance through the Career Resources Center or Student Services Office at your school before you commit to a specific program of study. Do Your Homework • As you work on identifying goals, try to visualize a long-range goal. A long-range goal will help you identify intermediate and shorter-range goals (milestones) that you might build into your navigation plan. 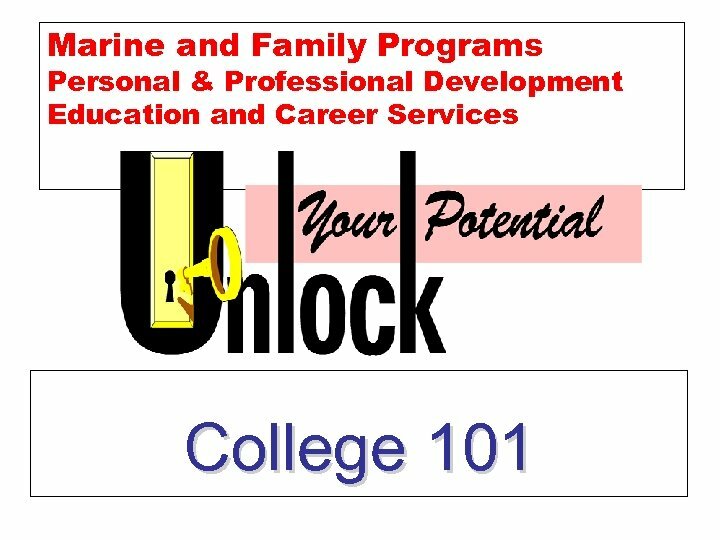 • Even if you don’t know what you “want to be” years from now, there are still a wide variety of learning experiences you can start out with that will create employment options for the near future as well as help you prepare for future programs of study. We’ll cover those in a moment. • Don’t “dead-end” yourself by wasting time and money on something from which you receive no real benefit. That’s why you’re being encouraged to do your homework now – “up front” – before you make a long-term commitment! 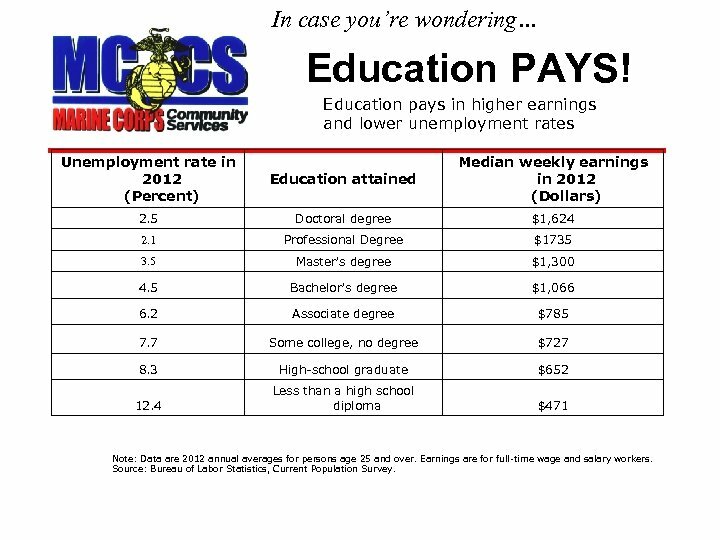 In case you’re wondering… Education PAYS! Education pays in higher earnings and lower unemployment rates Unemployment rate in 2012 (Percent) Education attained Median weekly earnings in 2012 (Dollars) 2. 5 Doctoral degree $1, 624 2. 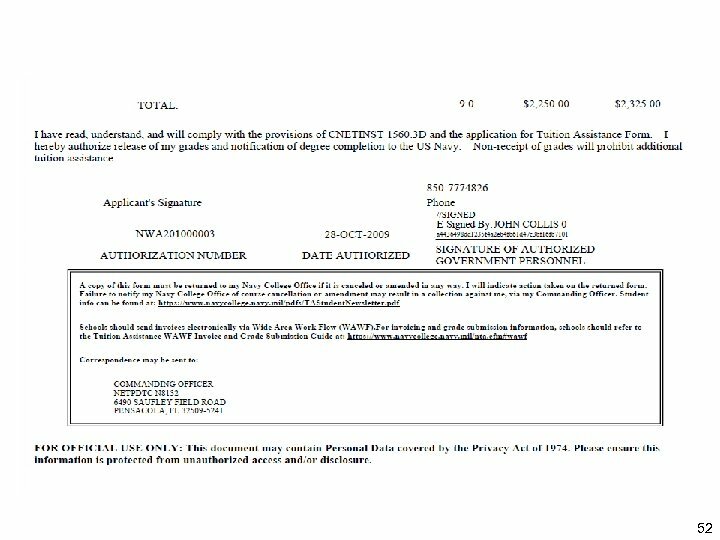 1 Professional Degree $1735 3. 5 Master's degree $1, 300 4. 5 Bachelor's degree $1, 066 6. 2 Associate degree $785 7. 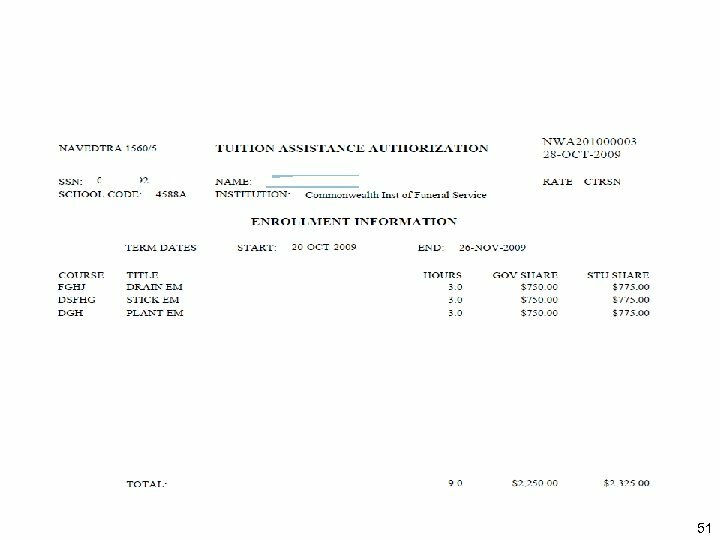 7 Some college, no degree $727 8. 3 High-school graduate $652 12. 4 Less than a high school diploma $471 Note: Data are 2012 annual averages for persons age 25 and over. Earnings are for full-time wage and salary workers. Source: Bureau of Labor Statistics, Current Population Survey. 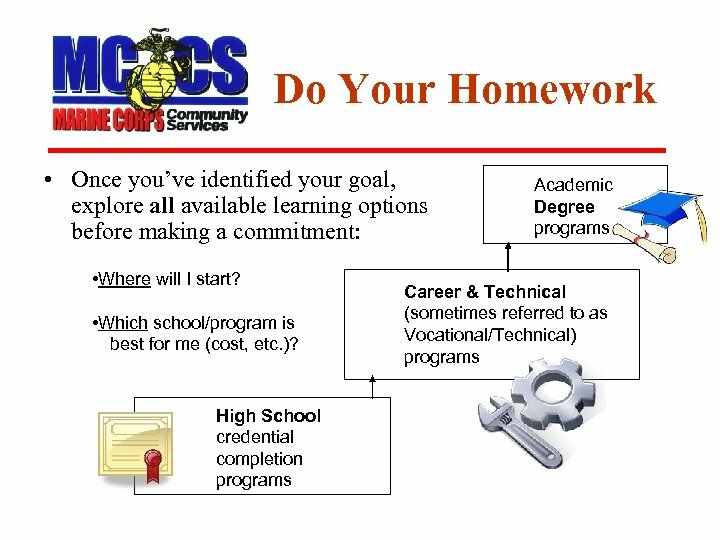 Do Your Homework • High School Completion – If you do not hold a valid high school credential, you must make that your FIRST priority. 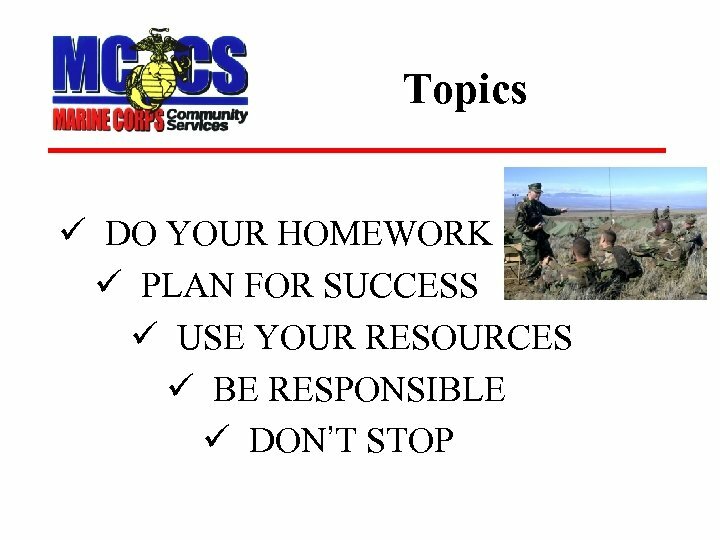 – The Marine Corps will fully fund your program (in accordance with policy covered later in this presentation). Contact an Education Center for help. 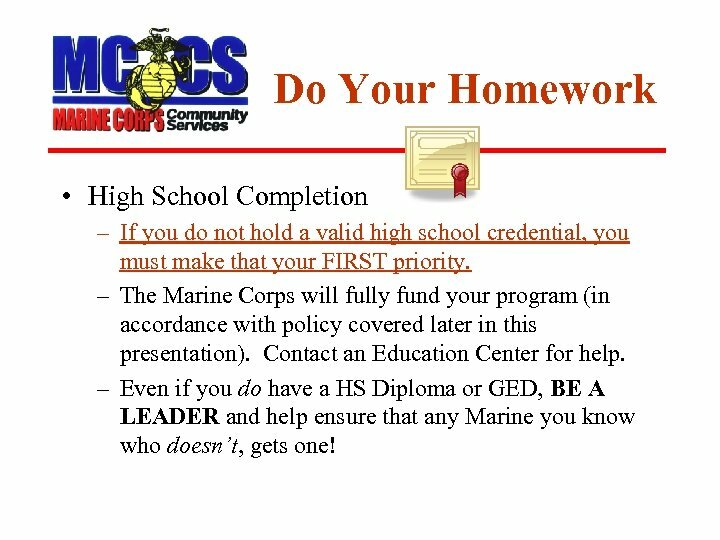 – Even if you do have a HS Diploma or GED, BE A LEADER and help ensure that any Marine you know who doesn’t, gets one! 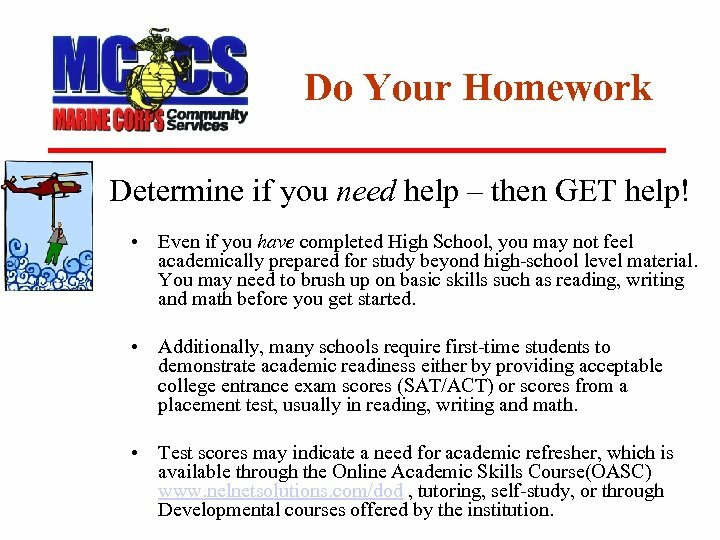 Do Your Homework Determine if you need help – then GET help! • Even if you have completed High School, you may not feel academically prepared for study beyond high-school level material. You may need to brush up on basic skills such as reading, writing and math before you get started. • Additionally, many schools require first-time students to demonstrate academic readiness either by providing acceptable college entrance exam scores (SAT/ACT) or scores from a placement test, usually in reading, writing and math. 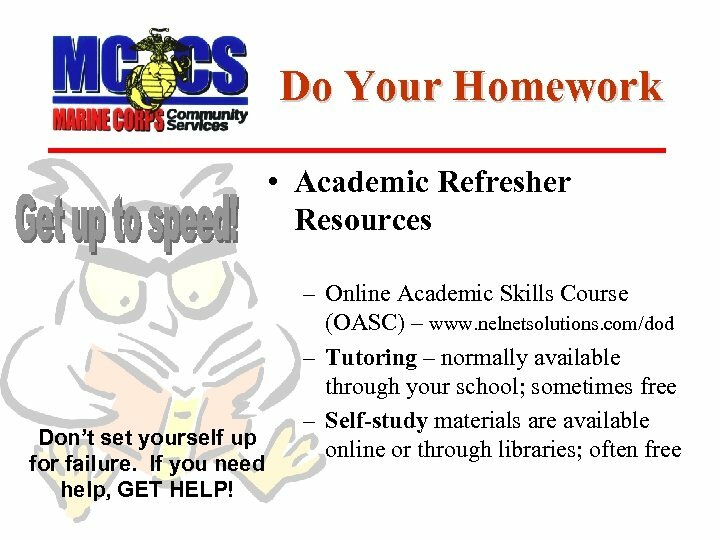 • Test scores may indicate a need for academic refresher, which is available through the Online Academic Skills Course(OASC) www. nelnetsolutions. 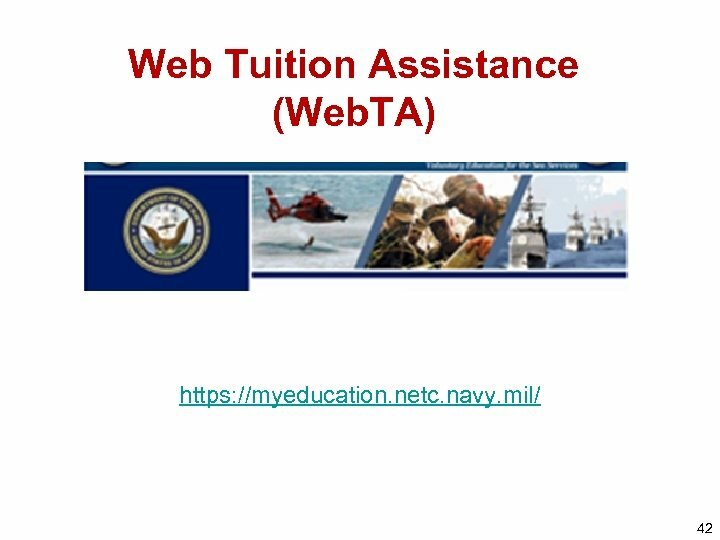 com/dod , tutoring, self-study, or through Developmental courses offered by the institution. Plan for Success • So, you have a goal. You’ve refreshed your basic skills (academic, computer, etc. ). Now you need to work on a plan for success. 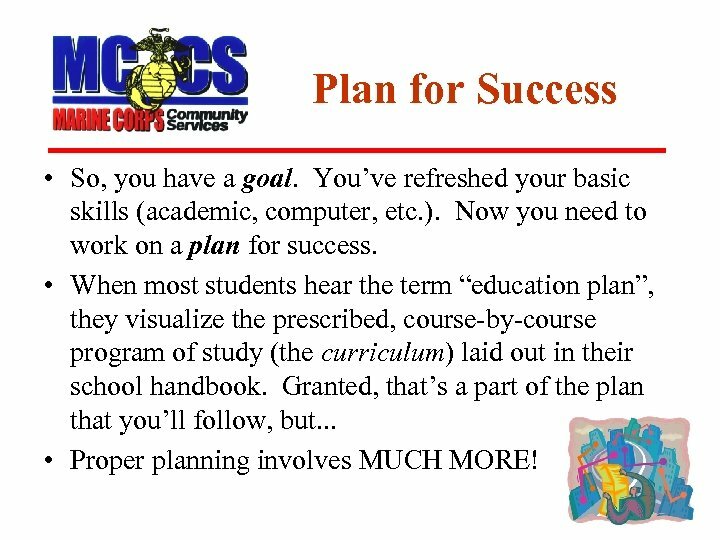 • When most students hear the term “education plan”, they visualize the prescribed, course-by-course program of study (the curriculum) laid out in their school handbook. Granted, that’s a part of the plan that you’ll follow, but. . . • Proper planning involves MUCH MORE! 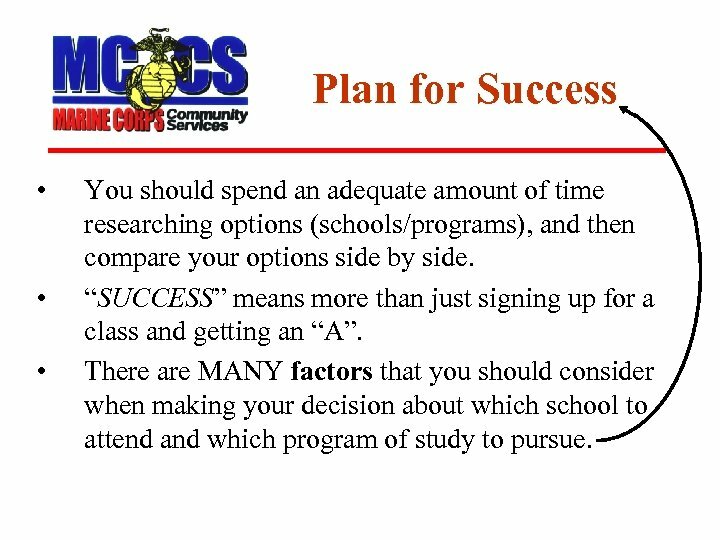 Plan for Success • • • You should spend an adequate amount of time researching options (schools/programs), and then compare your options side by side. “SUCCESS” means more than just signing up for a class and getting an “A”. There are MANY factors that you should consider when making your decision about which school to attend and which program of study to pursue. 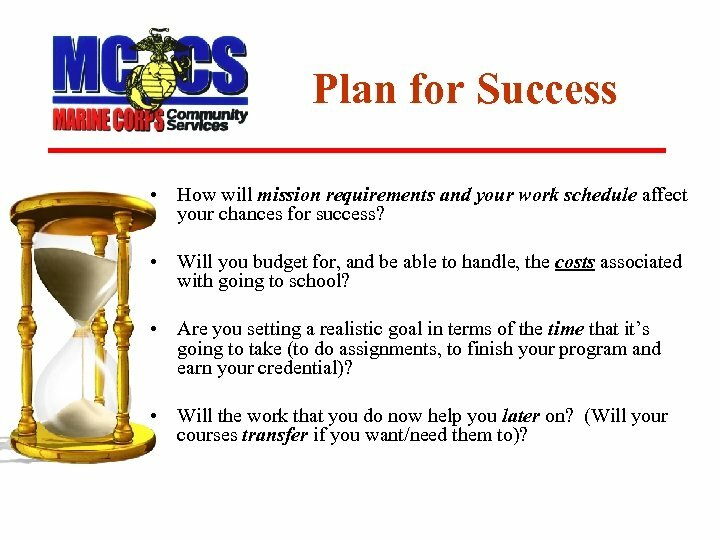 Plan for Success • How will mission requirements and your work schedule affect your chances for success? • Will you budget for, and be able to handle, the costs associated with going to school? 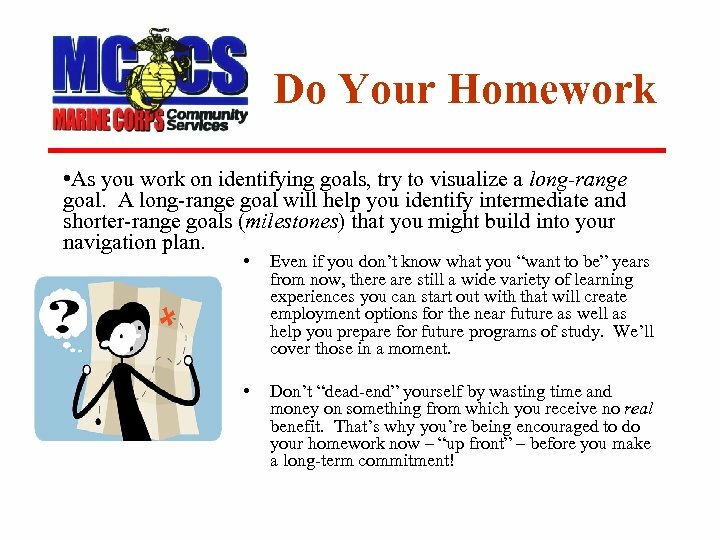 • Are you setting a realistic goal in terms of the time that it’s going to take (to do assignments, to finish your program and earn your credential)? • Will the work that you do now help you later on? 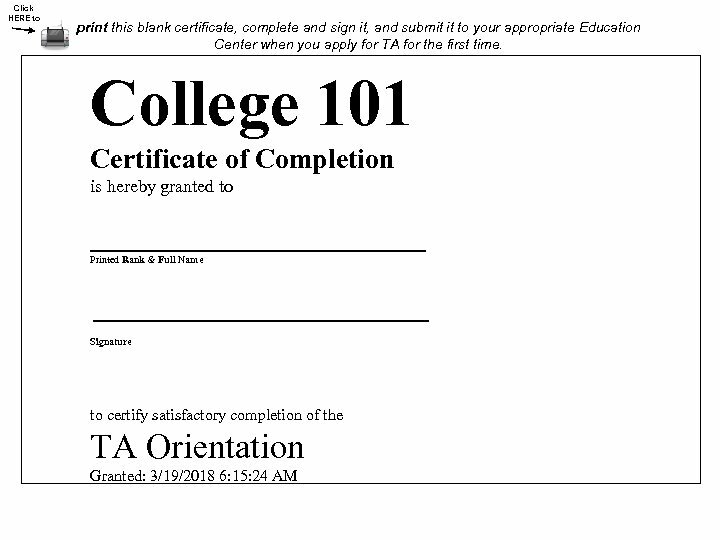 (Will your courses transfer if you want/need them to)? 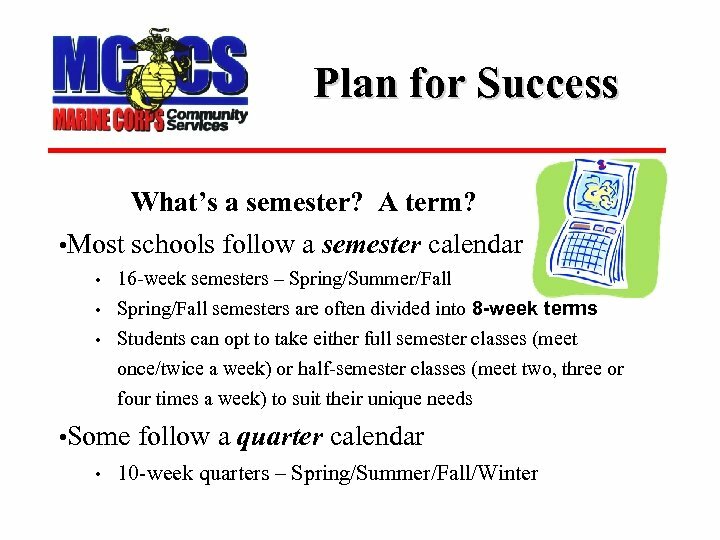 Plan for Success • Those are just a few of the factors all first-time students should consider prior to signing enrollment agreements or any other type of contracts. • Don’t give in to pressure or clever sales tactics. 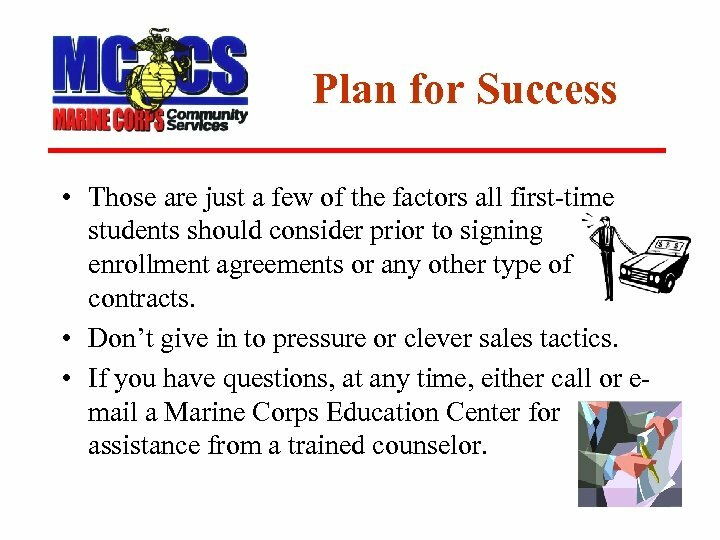 • If you have questions, at any time, either call or email a Marine Corps Education Center for assistance from a trained counselor. 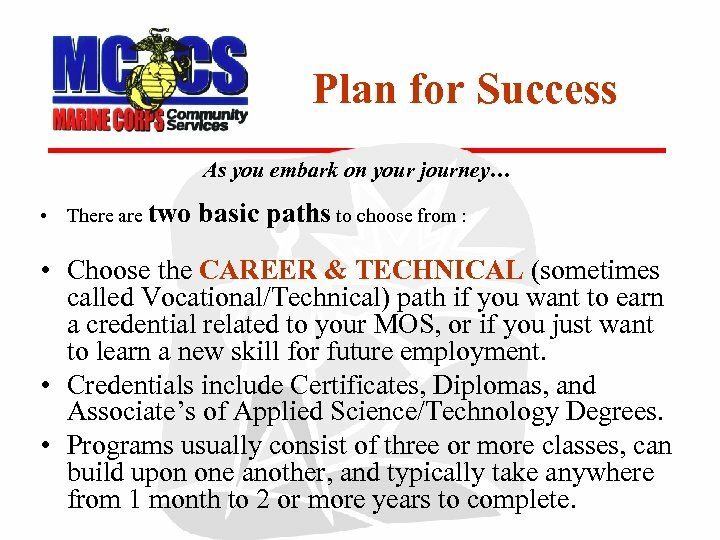 Plan for Success As you embark on your journey… • There are two basic paths to choose from : • Choose the CAREER & TECHNICAL (sometimes called Vocational/Technical) path if you want to earn a credential related to your MOS, or if you just want to learn a new skill for future employment. • Credentials include Certificates, Diplomas, and Associate’s of Applied Science/Technology Degrees. • Programs usually consist of three or more classes, can build upon one another, and typically take anywhere from 1 month to 2 or more years to complete. 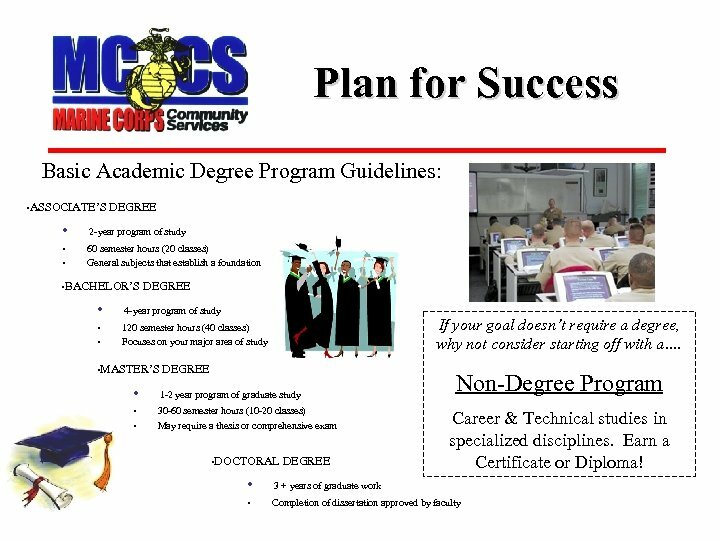 Plan for Success • Or, choose the ACADEMIC DEGREE path if that’s the direction your career goal requires you to take. – Many careers require Associate’s Degrees, or even Bachelor’s Degrees or higher, for entry-level employment. • Credentials include Associate’s, Bachelor’s, Master’s, First Professional, and Doctorate Degrees. – Academic Associate’s Degrees are sometimes referred to as Transfer Degrees, because the credit earned (Freshman/Sophomore-level) is designed to transfer into Bachelor’s Degree programs. – If your long-term career goal requires that you earn a Bachelor’s Degree, why not consider starting off with a Transfer Associate’s. 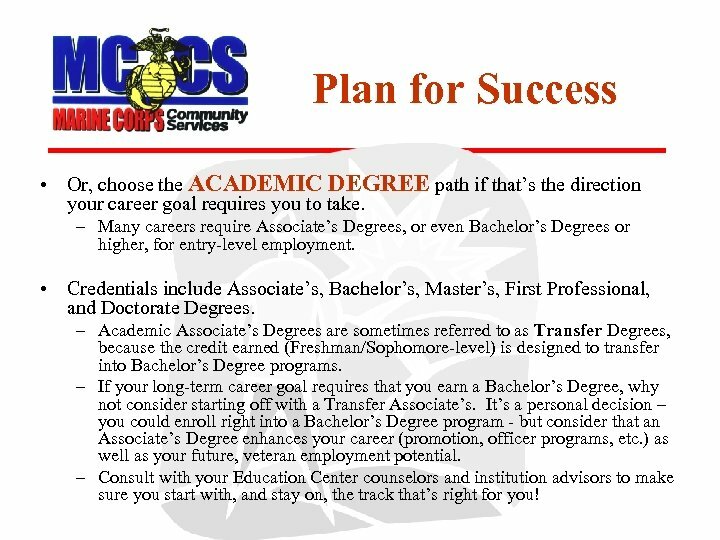 It’s a personal decision – you could enroll right into a Bachelor’s Degree program - but consider that an Associate’s Degree enhances your career (promotion, officer programs, etc. ) as well as your future, veteran employment potential. – Consult with your Education Center counselors and institution advisors to make sure you start with, and stay on, the track that’s right for you! 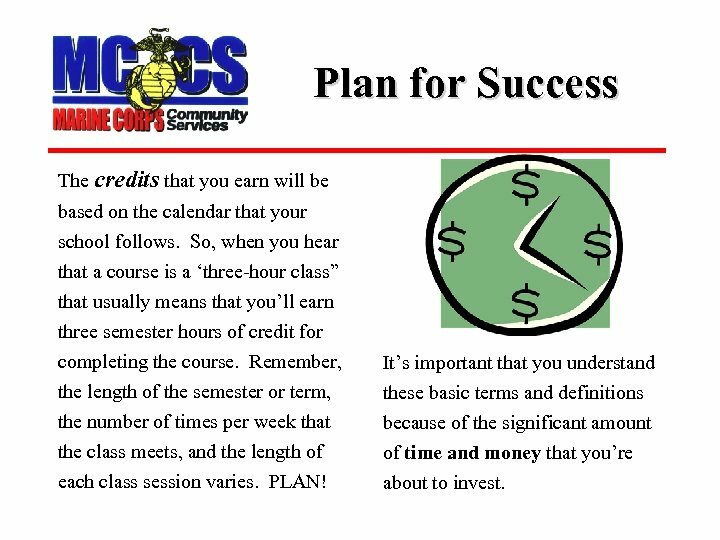 Plan for Success The credits that you earn will be based on the calendar that your school follows. So, when you hear that a course is a ‘three-hour class” that usually means that you’ll earn three semester hours of credit for completing the course. Remember, the length of the semester or term, the number of times per week that the class meets, and the length of each class session varies. PLAN! It’s important that you understand these basic terms and definitions because of the significant amount of time and money that you’re about to invest. 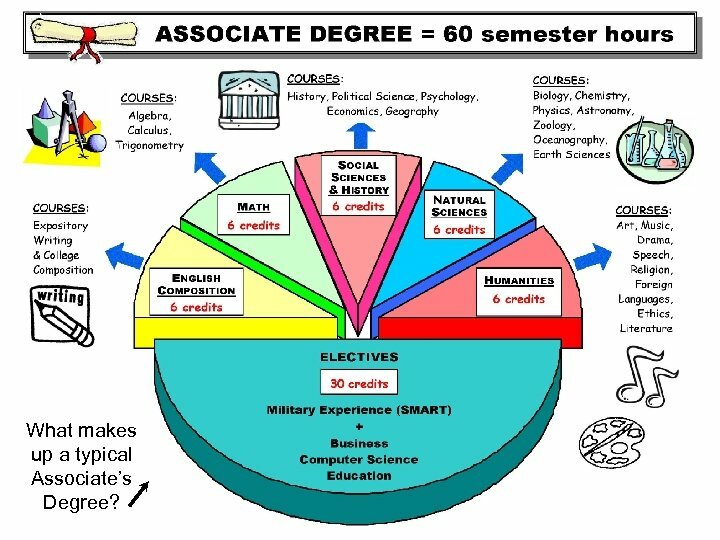 What makes up a typical Associate’s Degree? 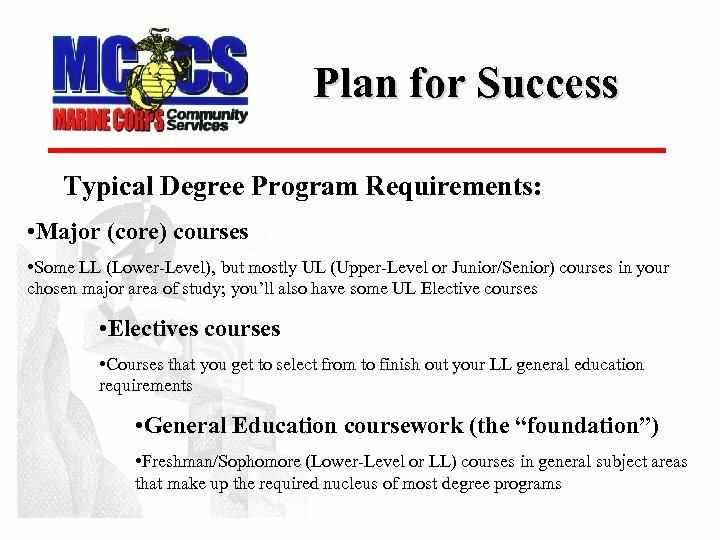 Plan for Success • Schools deliver their courses in a variety of ways. 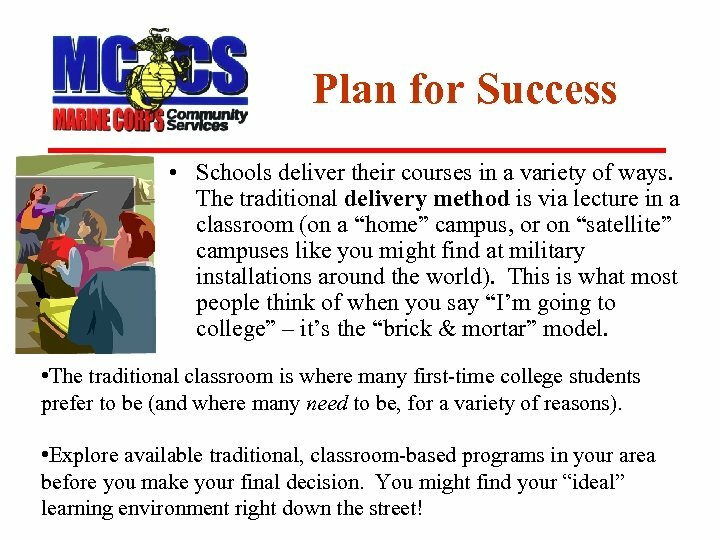 The traditional delivery method is via lecture in a classroom (on a “home” campus, or on “satellite” campuses like you might find at military installations around the world). This is what most people think of when you say “I’m going to college” – it’s the “brick & mortar” model. • The traditional classroom is where many first-time college students prefer to be (and where many need to be, for a variety of reasons). • Explore available traditional, classroom-based programs in your area before you make your final decision. You might find your “ideal” learning environment right down the street! 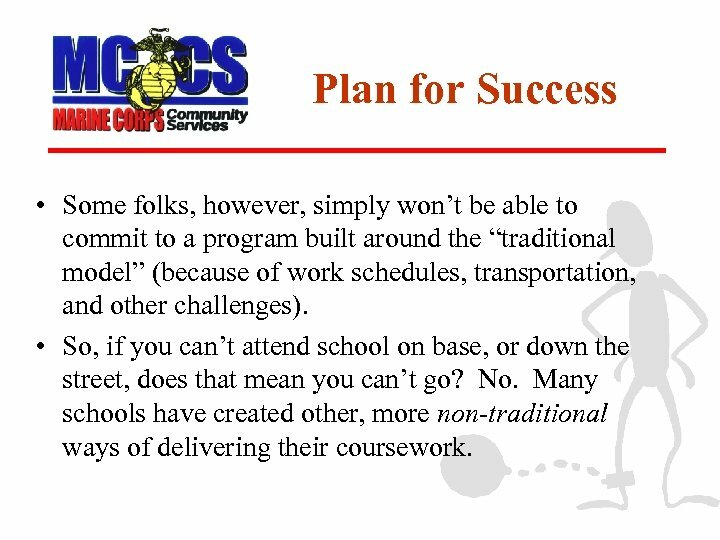 Plan for Success • Some folks, however, simply won’t be able to commit to a program built around the “traditional model” (because of work schedules, transportation, and other challenges). • So, if you can’t attend school on base, or down the street, does that mean you can’t go? No. Many schools have created other, more non-traditional ways of delivering their coursework. 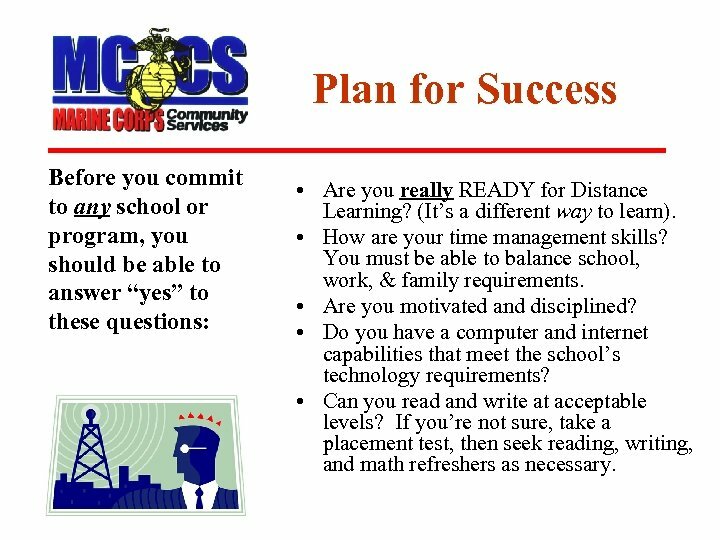 Plan for Success Before you commit to any school or program, you should be able to answer “yes” to these questions: • Are you really READY for Distance Learning? (It’s a different way to learn). • How are your time management skills? You must be able to balance school, work, & family requirements. • Are you motivated and disciplined? • Do you have a computer and internet capabilities that meet the school’s technology requirements? • Can you read and write at acceptable levels? If you’re not sure, take a placement test, then seek reading, writing, and math refreshers as necessary. 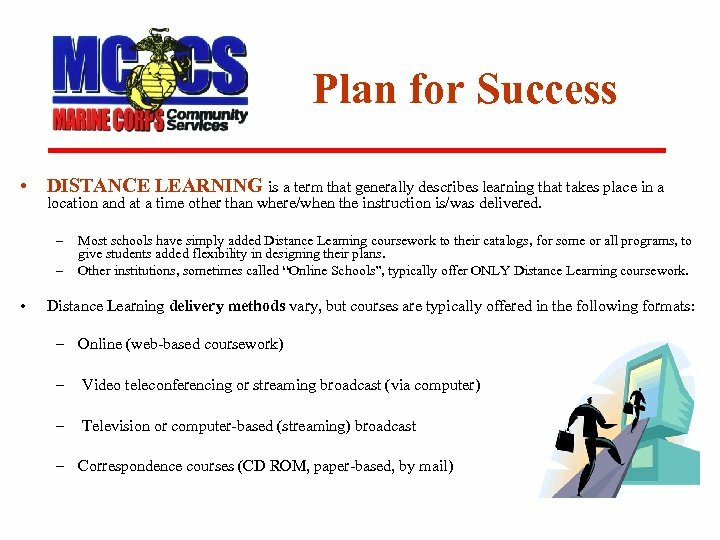 Plan for Success Have you really researched (and compared) Distance Learning options? • Be wary of any school that claims: “Complete your Bachelor’s degree in 12 to 18 months!” – Although that’s possible, it’s probably not likely, and may even be completely unrealistic. 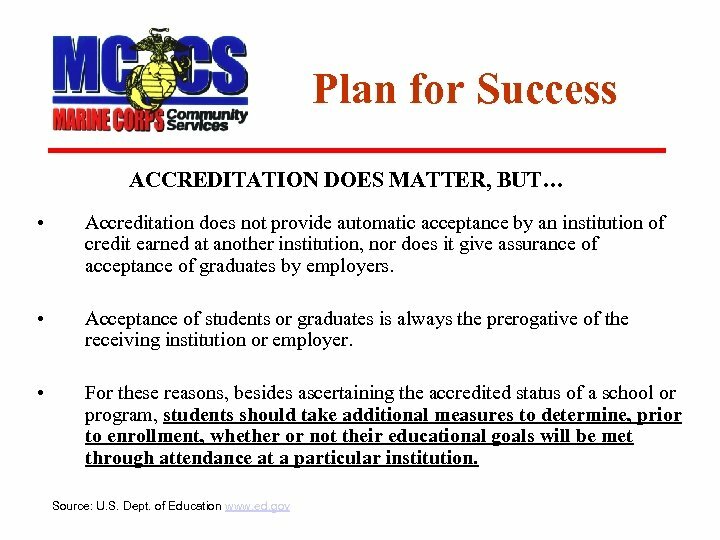 Some schools make this claim (as a recruiting tactic) regardless of how many credits you bring into the program. It almost always takes longer than that, even if you already have credit, and certainly longer if you’ve never attended college. 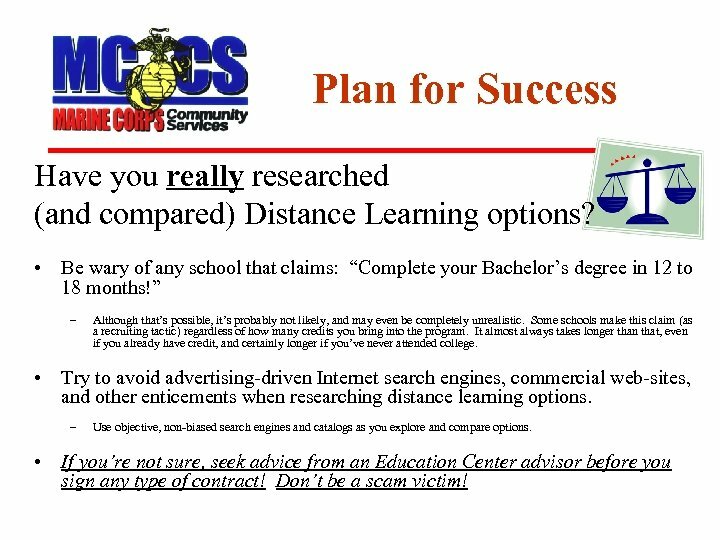 • Try to avoid advertising-driven Internet search engines, commercial web-sites, and other enticements when researching distance learning options. – Use objective, non-biased search engines and catalogs as you explore and compare options. • If you’re not sure, seek advice from an Education Center advisor before you sign any type of contract! Don’t be a scam victim! 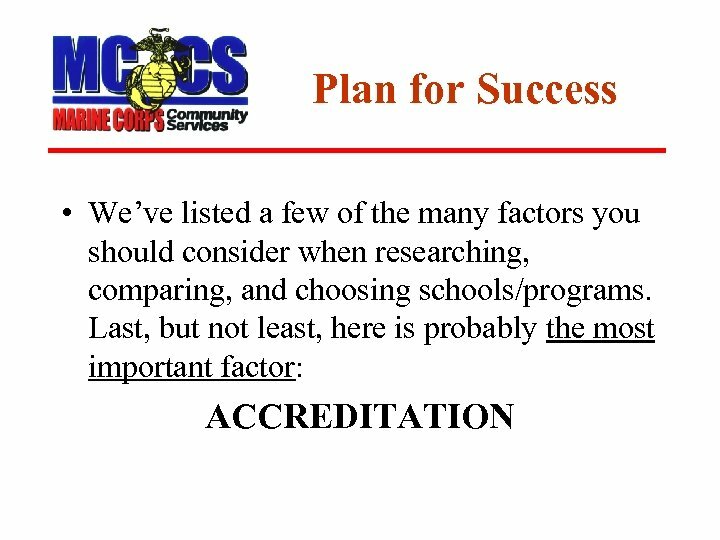 Plan for Success SOCMAR (Service members Opportunity Colleges Marine Corps) • One way to ensure that your school is properly accredited is to verify that they’re a SOC Member School, and/or that they have programs in the SOCMAR Degree Networks. 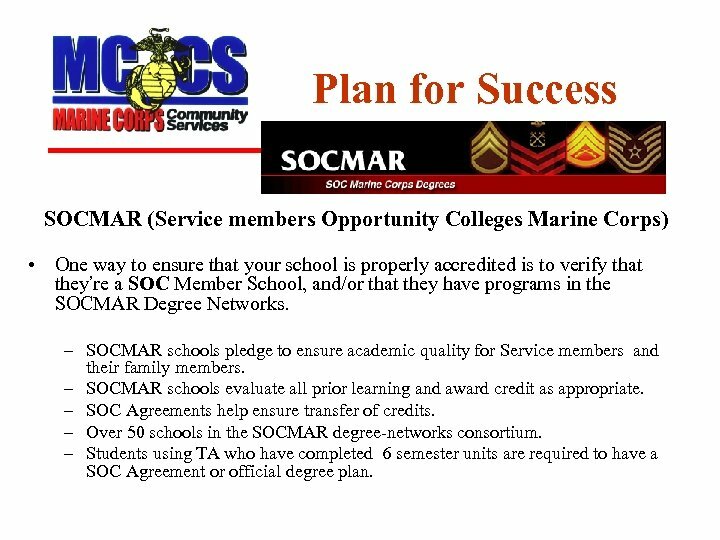 – SOCMAR schools pledge to ensure academic quality for Service members and their family members. 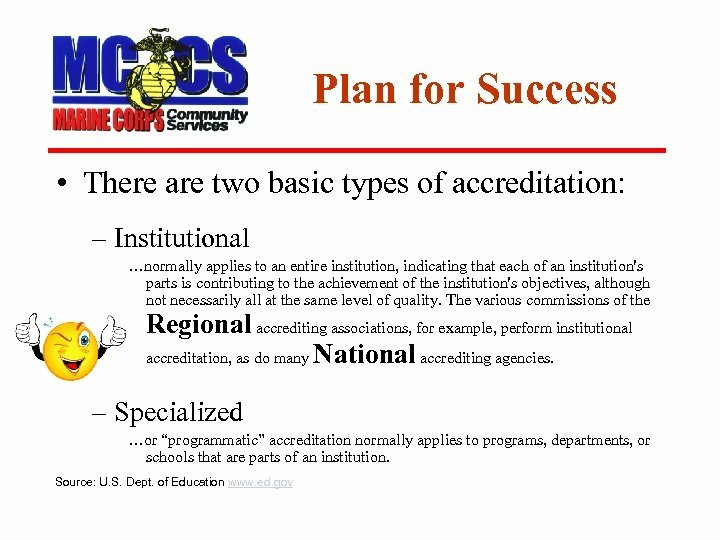 – SOCMAR schools evaluate all prior learning and award credit as appropriate. – SOC Agreements help ensure transfer of credits. – Over 50 schools in the SOCMAR degree-networks consortium. 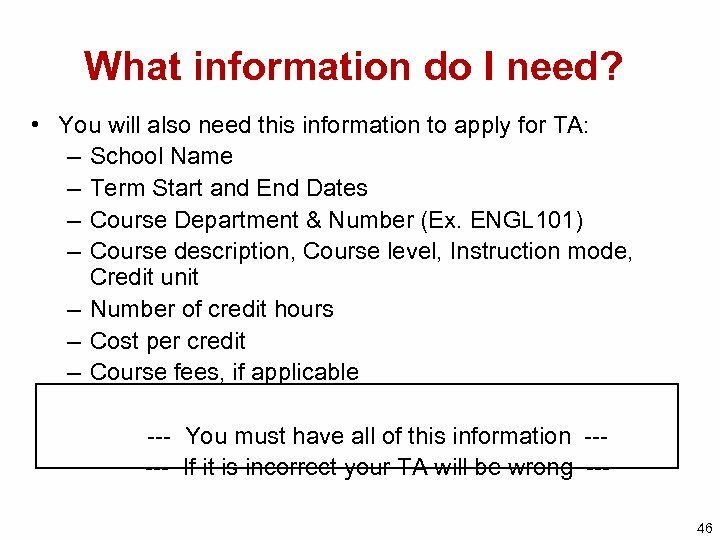 – Students using TA who have completed 6 semester units are required to have a SOC Agreement or official degree plan. Use Your Resources • You can’t begin to imagine how many resources you have at your disposal to help you succeed. 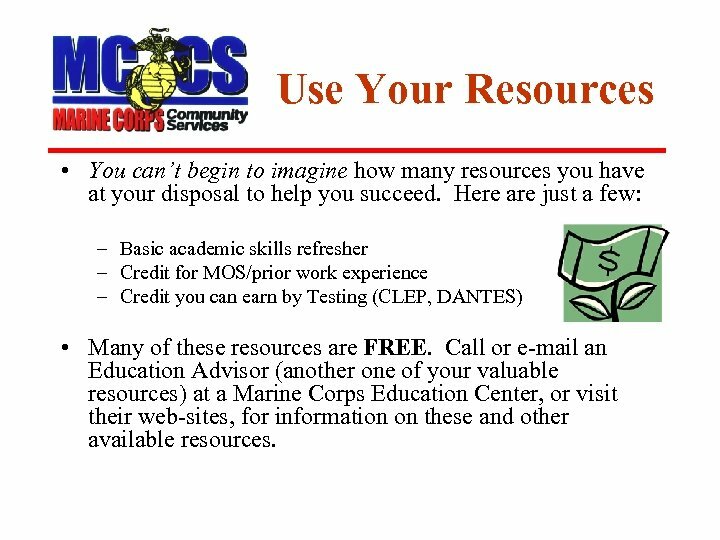 Here are just a few: – Basic academic skills refresher – Credit for MOS/prior work experience – Credit you can earn by Testing (CLEP, DANTES) • Many of these resources are FREE. 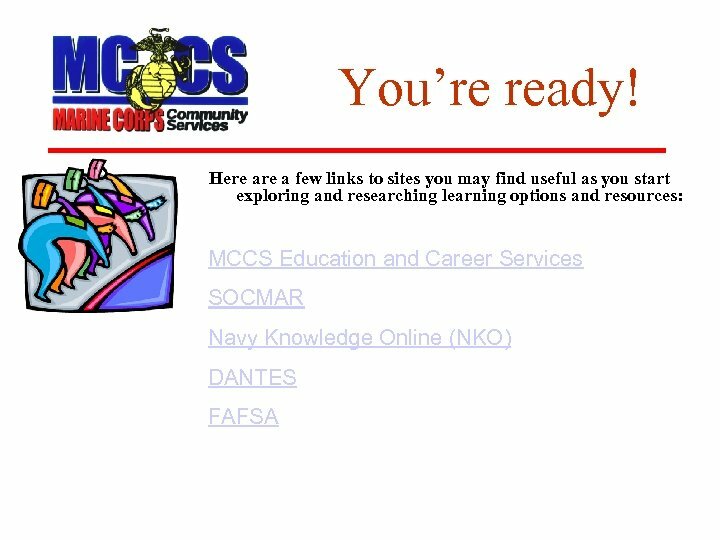 Call or e-mail an Education Advisor (another one of your valuable resources) at a Marine Corps Education Center, or visit their web-sites, for information on these and other available resources. 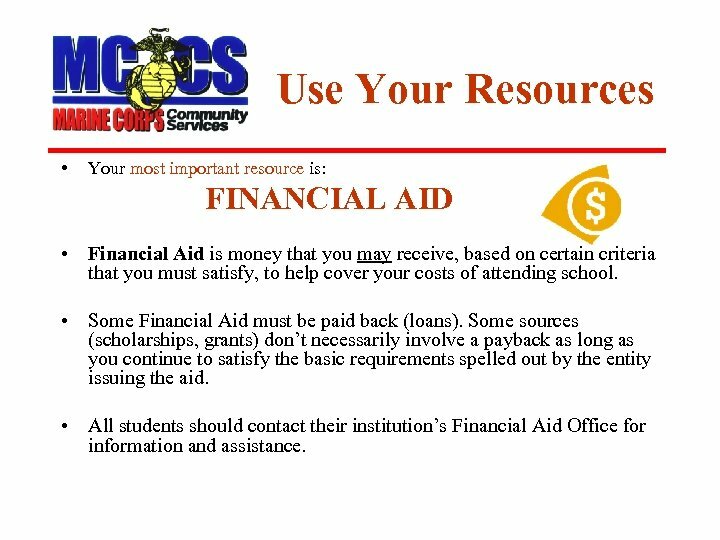 Use Your Resources • Your most important resource is: FINANCIAL AID • Financial Aid is money that you may receive, based on certain criteria that you must satisfy, to help cover your costs of attending school. • Some Financial Aid must be paid back (loans). 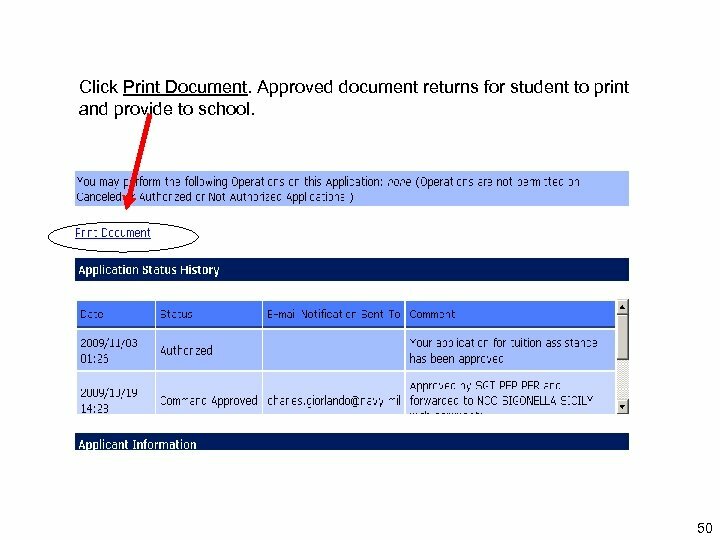 Some sources (scholarships, grants) don’t necessarily involve a payback as long as you continue to satisfy the basic requirements spelled out by the entity issuing the aid. 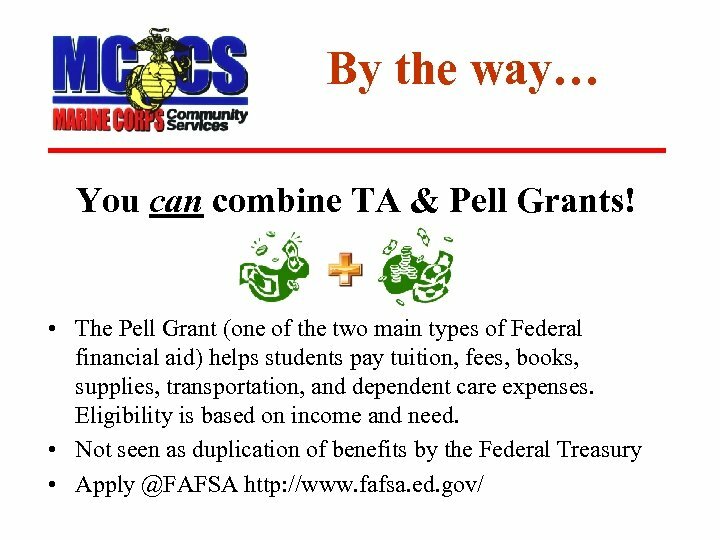 • All students should contact their institution’s Financial Aid Office for information and assistance. 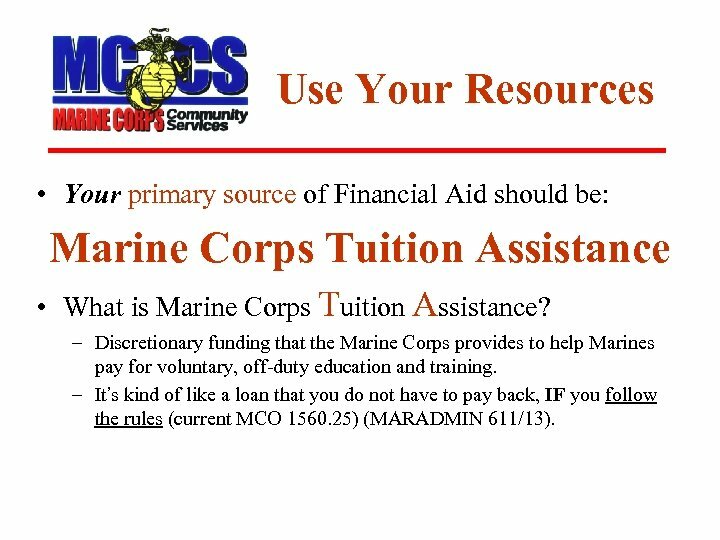 Use Your Resources • Your primary source of Financial Aid should be: Marine Corps Tuition Assistance • What is Marine Corps Tuition Assistance? 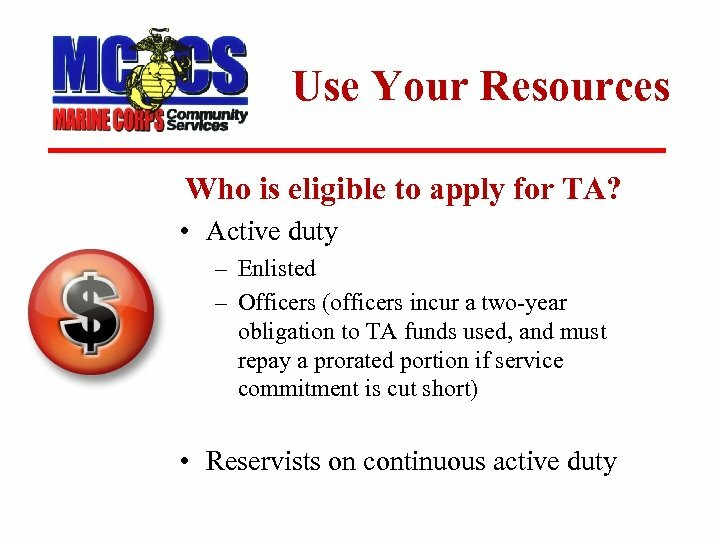 – Discretionary funding that the Marine Corps provides to help Marines pay for voluntary, off-duty education and training. – It’s kind of like a loan that you do not have to pay back, IF you follow the rules (current MCO 1560. 25) (MARADMIN 611/13). 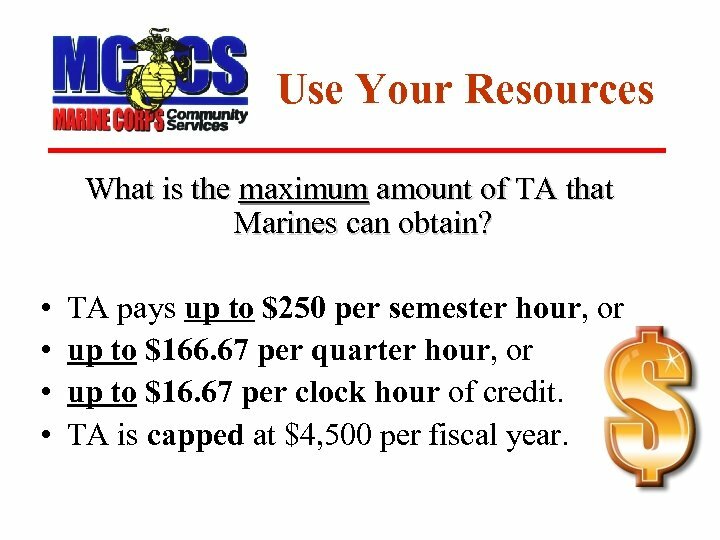 Use Your Resources What is the maximum amount of TA that Marines can obtain? • • TA pays up to $250 per semester hour, or up to $166. 67 per quarter hour, or up to $16. 67 per clock hour of credit. 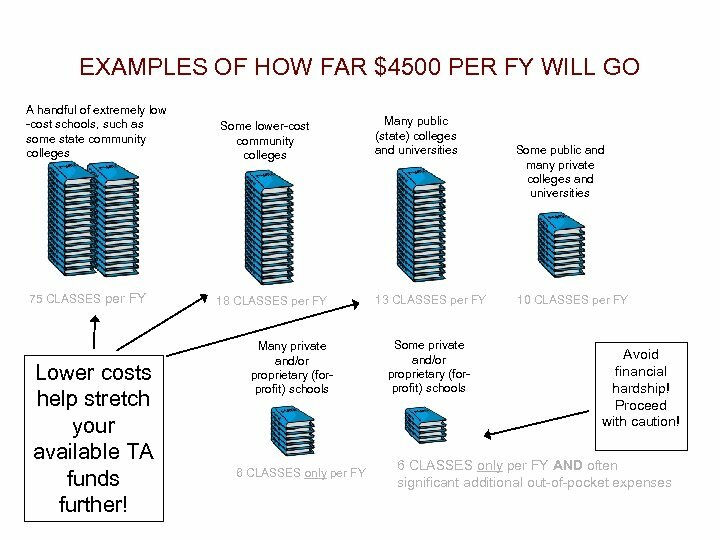 TA is capped at $4, 500 per fiscal year. 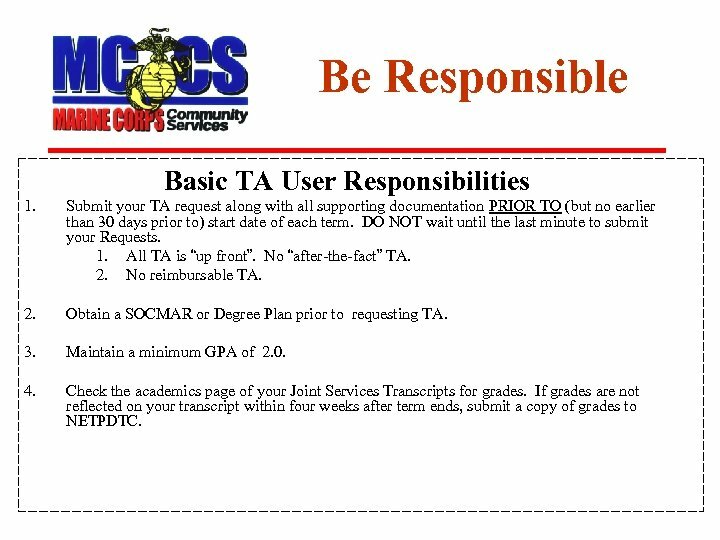 Be Responsible Basic TA User Responsibilities 1. 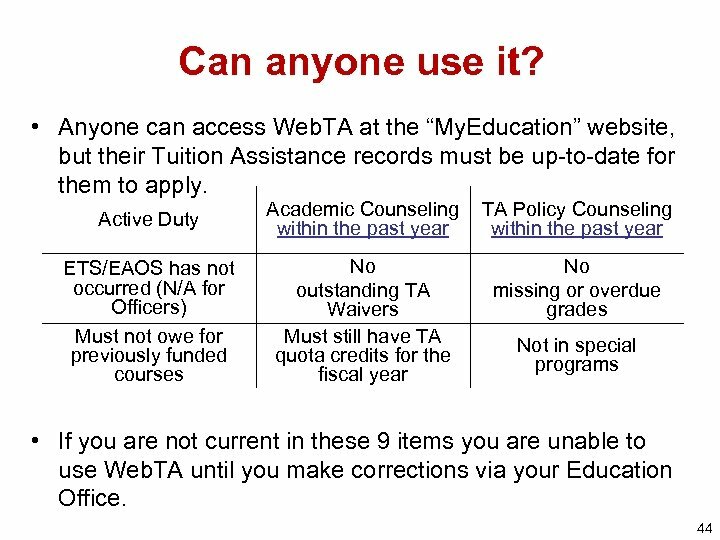 Submit your TA request along with all supporting documentation PRIOR TO (but no earlier than 30 days prior to) start date of each term. DO NOT wait until the last minute to submit your Requests. 1. All TA is “up front”. No “after-the-fact” TA. 2. No reimbursable TA. 2. 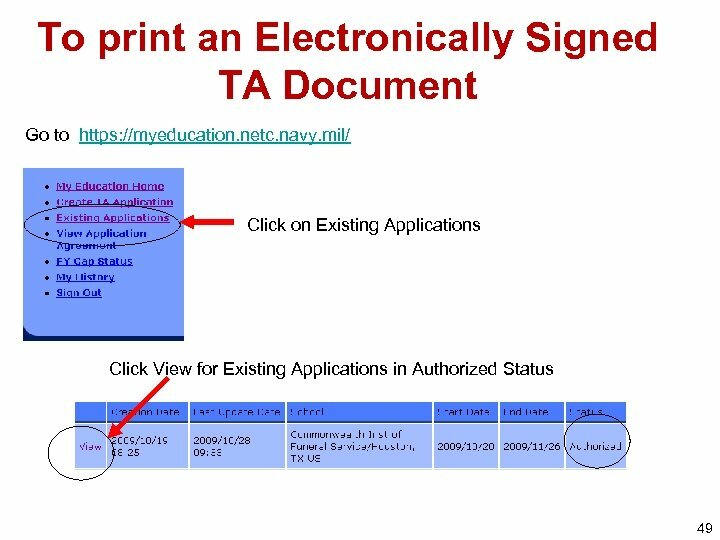 Obtain a SOCMAR or Degree Plan prior to requesting TA. 3. Maintain a minimum GPA of 2. 0. 4. Check the academics page of your Joint Services Transcripts for grades. If grades are not reflected on your transcript within four weeks after term ends, submit a copy of grades to NETPDTC. IMPORTANT You WILL… 1. 2. 3. 4. Pay and all student share (anything above and beyond TA caps). Repay the government for Failing (“F”) grades. NO WAIVERS! 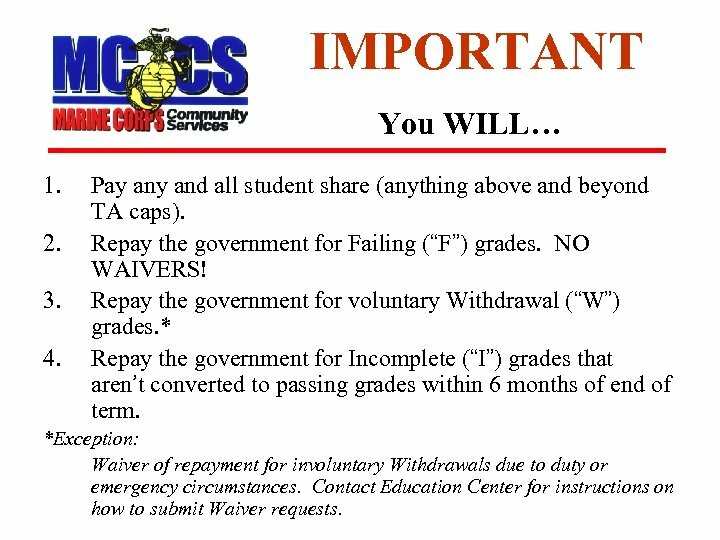 Repay the government for voluntary Withdrawal (“W”) grades. * Repay the government for Incomplete (“I”) grades that aren’t converted to passing grades within 6 months of end of term. *Exception: Waiver of repayment for involuntary Withdrawals due to duty or emergency circumstances. 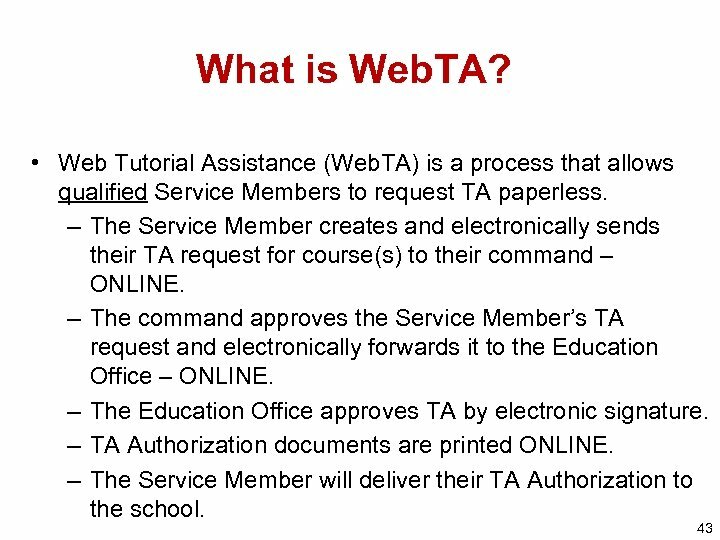 Contact Education Center for instructions on how to submit Waiver requests. 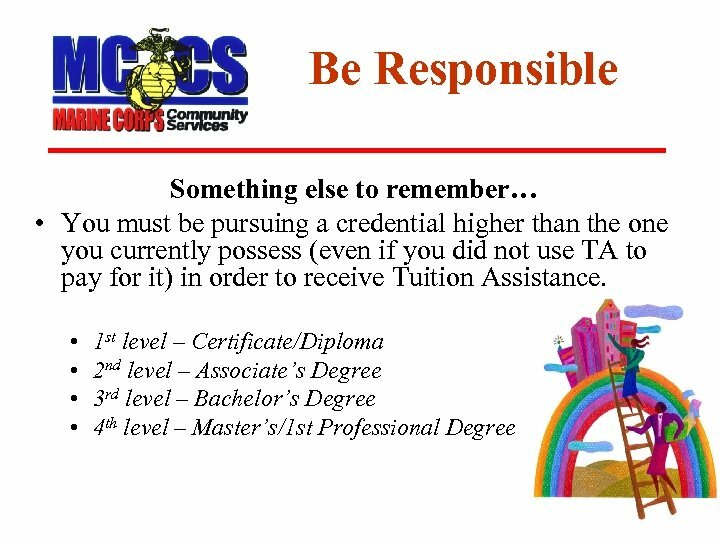 Be Responsible Need to make changes to your TA Voucher? 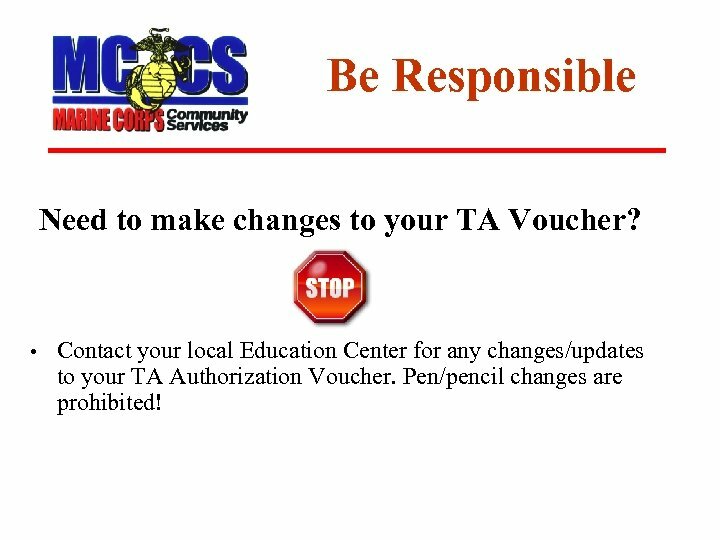 • Contact your local Education Center for any changes/updates to your TA Authorization Voucher. Pen/pencil changes are prohibited! 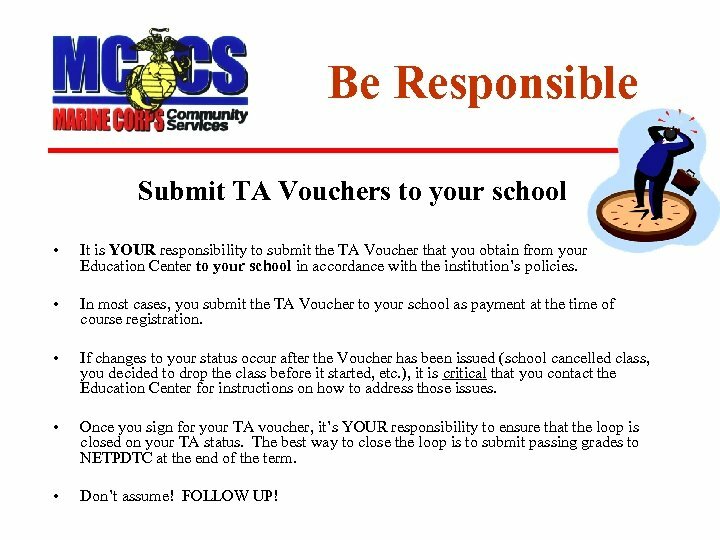 Be Responsible Submit TA Vouchers to your school • It is YOUR responsibility to submit the TA Voucher that you obtain from your Education Center to your school in accordance with the institution’s policies. • In most cases, you submit the TA Voucher to your school as payment at the time of course registration. 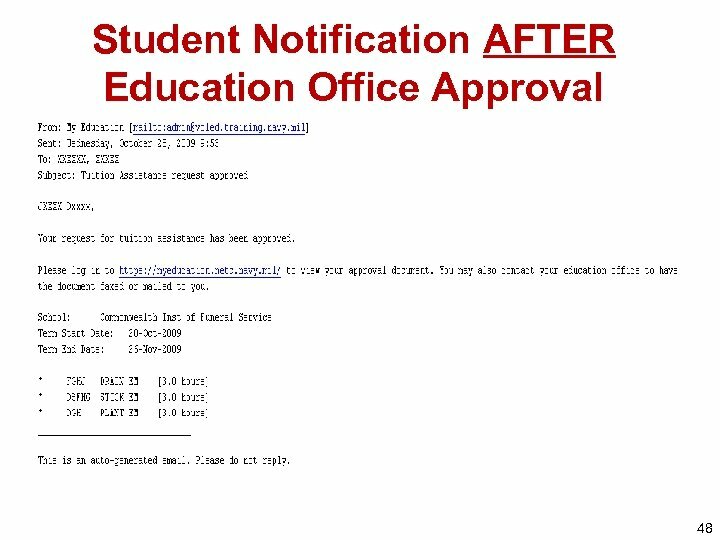 • If changes to your status occur after the Voucher has been issued (school cancelled class, you decided to drop the class before it started, etc. 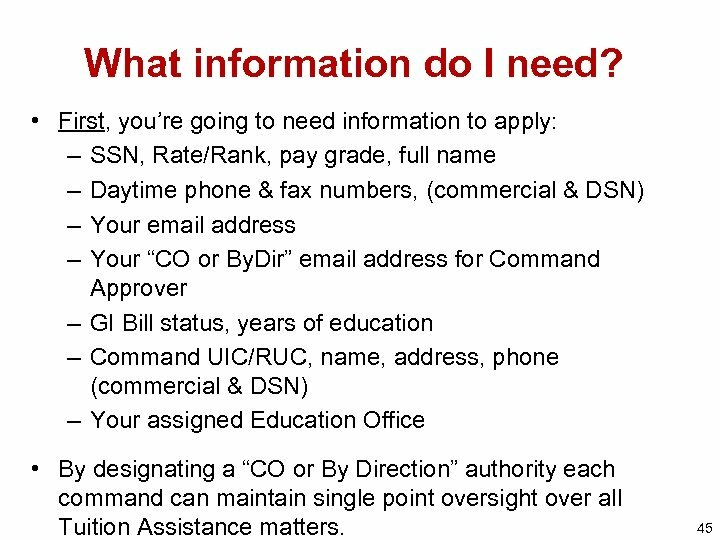 ), it is critical that you contact the Education Center for instructions on how to address those issues. 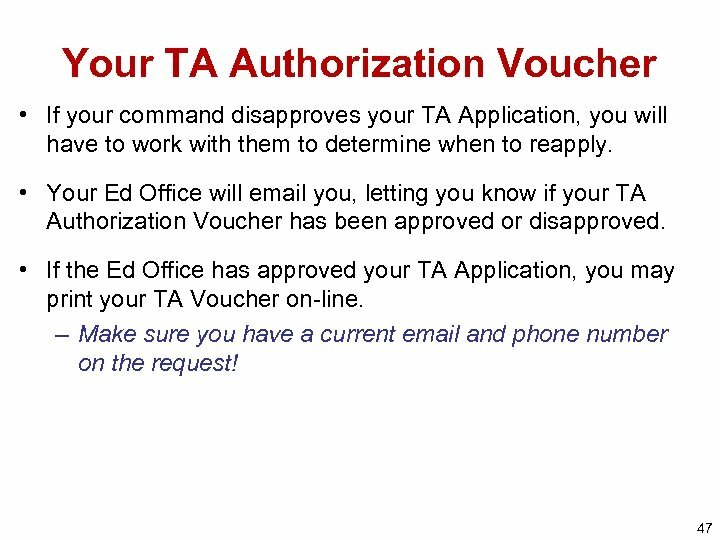 • Once you sign for your TA voucher, it’s YOUR responsibility to ensure that the loop is closed on your TA status. The best way to close the loop is to submit passing grades to NETPDTC at the end of the term. • Don’t assume! FOLLOW UP! 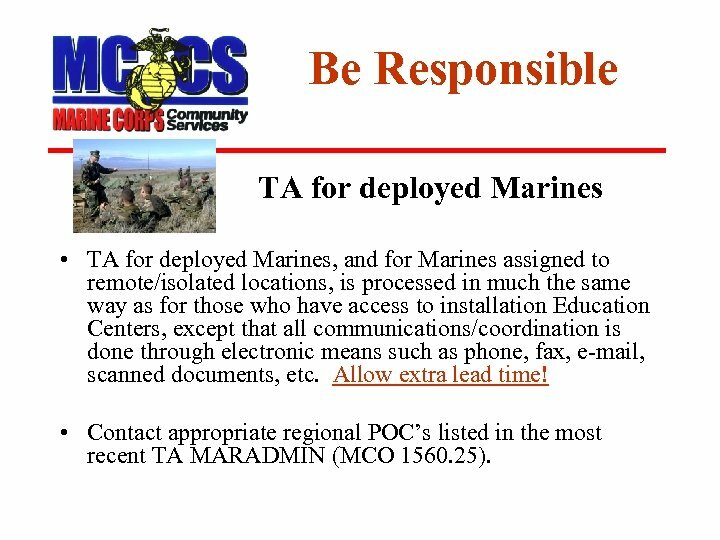 Be Responsible TA for deployed Marines • TA for deployed Marines, and for Marines assigned to remote/isolated locations, is processed in much the same way as for those who have access to installation Education Centers, except that all communications/coordination is done through electronic means such as phone, fax, e-mail, scanned documents, etc. Allow extra lead time! • Contact appropriate regional POC’s listed in the most recent TA MARADMIN (MCO 1560. 25). • End of fiscal year, every year – TA processing is halted on 15 September, and does not resume until 1 October. The “no-after-the-fact TA” rule still applies. 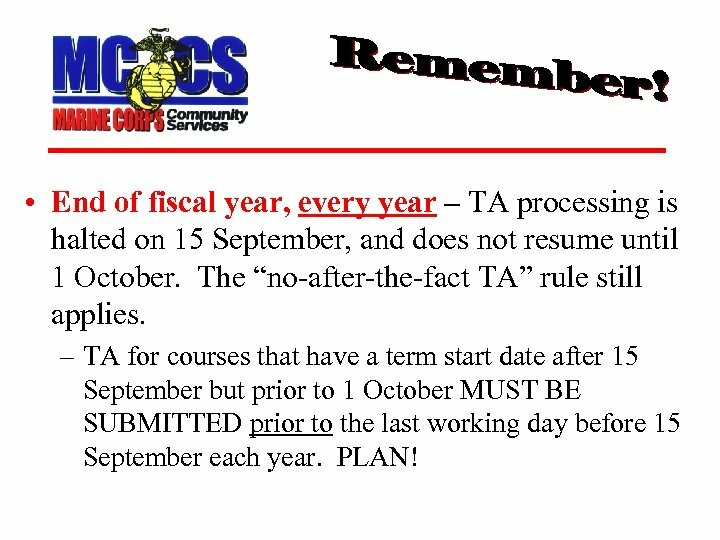 – TA for courses that have a term start date after 15 September but prior to 1 October MUST BE SUBMITTED prior to the last working day before 15 September each year. PLAN! 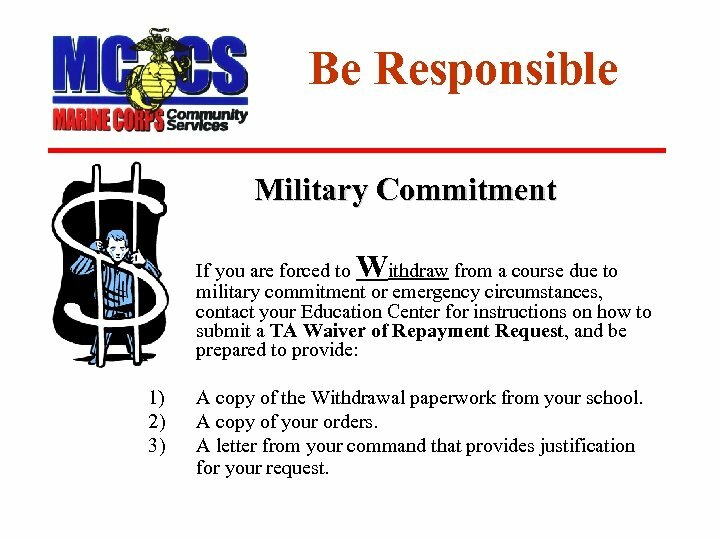 Be Responsible Military Commitment W • If you are forced to ithdraw from a course due to military commitment or emergency circumstances, contact your Education Center for instructions on how to submit a TA Waiver of Repayment Request, and be prepared to provide: 1) 2) 3) A copy of the Withdrawal paperwork from your school. A copy of your orders. A letter from your command that provides justification for your request. 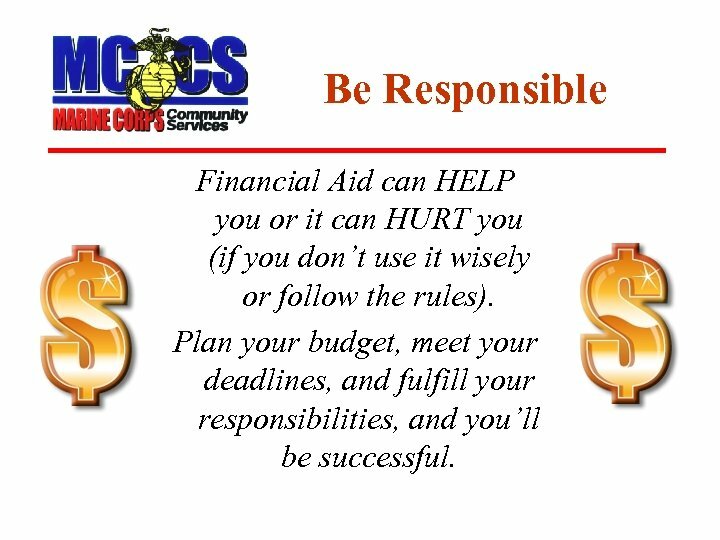 Be Responsible Financial Aid can HELP you or it can HURT you (if you don’t use it wisely or follow the rules). Plan your budget, meet your deadlines, and fulfill your responsibilities, and you’ll be successful. One More Thing… You’ve been encouraged to: 1. 2. 3. 4. 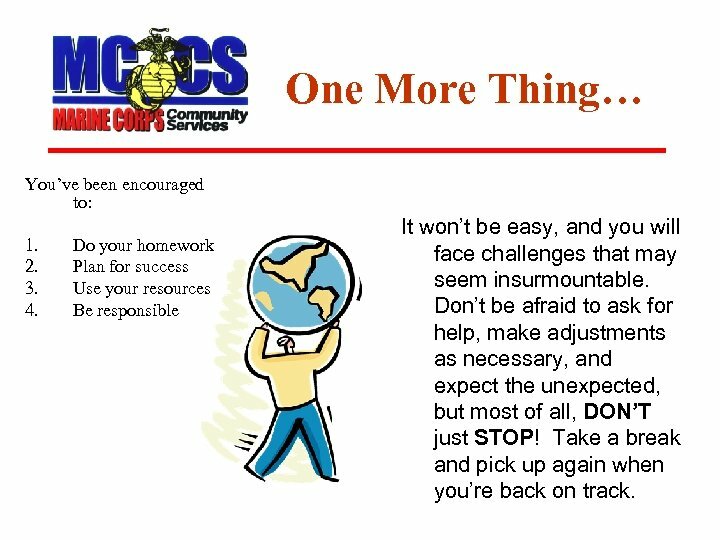 Do your homework Plan for success Use your resources Be responsible It won’t be easy, and you will face challenges that may seem insurmountable. Don’t be afraid to ask for help, make adjustments as necessary, and expect the unexpected, but most of all, DON’T just STOP! Take a break and pick up again when you’re back on track.